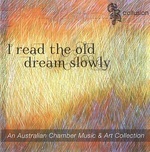 I read the old dream slowly : an Australian chamber music & art collection / Collusion. Le Tombeau de Monk / Joseph Twist. Le Tombeau de Monk is in homage to the jazz panist and composer Thelonious Sphere Monk, one of the most distinctive and mysterious jazz musicians. It as a commission from the Brisbane-based new music ensemble, Collusion. In a similar vein to Ravel's Le Tombeau de Couperin, which was devited to deceased soldiers from the First Wold War, Le Tombeau de Monk is dedicated to the memory of a close friend. A highly accomplished jazz pianist, Timothy Graham Hughes (1981-2005) passed away tragically in a car accident. While the friendship with Tim extended beyond music, I considered him a kind of mentor as we shared an interest in all kind of jazz, including the work of Thelonious Monk. Thematic material in "Le Tombeau de Monk" is based quite loosely on several tunes, including Well You Needn't, Bemsha Swing, Straight No Chaser, Blue Monk and Round Midnight, which unfold throughout the work in generally that order. Instrumentation: Clarinet in B flat (doubling on bass clarinet in B flat), violin, cello, piano. First performance: by Collusion — Aug 06. Queensland Conservatorium of Music, Ian Hanger Recital Hall. 20 Feb 2016: at Urban Myths (Glebe Justice Centre). Featuring Strelitzia Ensemble. 7 Oct 2012: at Collusion All Australian Music CD Launch (Fireworks Gallery). Featuring Collusion. 12 May 2012: at Collusion Music at the Crossbows Festival (Ian Hanger Recital Hall). Featuring Collusion. Aug 06: Queensland Conservatorium of Music, Ian Hanger Recital Hall.. Featuring Collusion.